We had to wait a while but, I finally took my wife for an airplane ride yesterday. Having a non-pilot passenger for the first time helped me realize that I really am a private pilot now. We had heavy snow Tuesday night and Wednesday morning. Thursday started out clear but the ATIS was reporting 7000 overcast when we got to the airport at 1:30 PM. More snow was forecast to start in the evening but, we had a comfortably long window to get the flight in. It was cold though. Only 23 degrees when we took off. The airplane was in the hanger so I got to do the preflight in comfort. One of the CFIs helped me pull it out onto the ice and packed snow covered ramp. He made a point to remind me that, not only would braking action be nil on the ramp but, I also wouldn’t have much nose wheel steering. I would have to use rudder and power to maneuver on the ice. Georgia got in the right seat where I helped her buckle in and showed her how the door latch worked. Then I jumped in the left seat, out of the cold. A short prime of the fuel injected engine and it started right up. I wouldn’t have any indication of oil temperature for a while so, I held off on the run up until we were at the runway. That’s normal procedure around here in the winter. The taxi time gives the engine some time to warm up a little. There was a snow plow working on the far end of runway 23 so tower had me hold until he was out of the way then, cleared us for takeoff. The cold air definitely helped our performance. We used very little runway to get off the ground. The whole flight was very smooth. 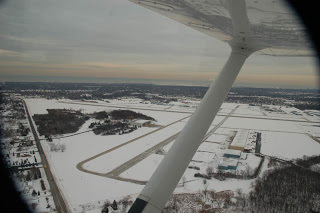 We did the obligatory turns around our house then flew to Lake Geneva, Wisconsin. The snow cover made the landscape look like a hand tinted black and white photograph. We were just flying and sight seeing with Georgia snapping an occasional picture. I talked her into taking the controls for a few minutes so she could try a couple turns, descents and climbs. Then, all too soon, we had to turn for home base. I wanted this first landing with Georgia on board to be a smooth one so, I worked hard at making a good flare and a gently touchdown. Then, it was back onto the icy ramp where I shut the airplane down outside the hanger door with 1.5 new hours on the Hobbs. In the car on the way home, Georgia asked when we could go again. That was exactly what I wanted to hear. I’m glad we waited for a smooth air day for this first flight. I couldn’t have asked for a better first ride for her. Nice! Sounds like you gave a great demonstration of what it is to be a pilot, the first of many! what a perfect experience for both of you – may you enjoy many more of the very same! What a great story. Reminds me of taking my daughter for her first ride ever. Thanks for sharing. Having a spouse that loves to fly sure makes life easy. Sounds like “you done good”. Once my Bride sat in the right seat she was hooked. When we fly now she likes to nap (her words) it’s more like after departure and on with flight following she is down for the count! Really nice blog, just found it and now playing catch up reading along. I had a WONDERFUL time and I trust my Pilot unconditionally. It will be hard for him to have flying time alone now that I have shared the wonder. I’m really happy that both of you enjoyed your first flight together! I can’t wait until my new finance and I take ours. Other people having trust in your pilot skills is a big deal. There is nothing more comforting than knowing that person in the left seat is confident in his or her skills. Makes flying much more enjoyable.